Maybe you’ve built a business from the ground up and are unsure how to take it to the next level, or maybe you already have an established brand name but you’ve suffered at the hands of your competition. 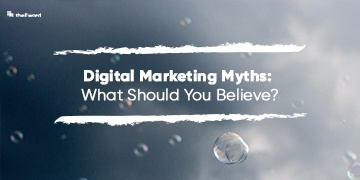 Either way, you need the knowledge and expertise of a digital marketing agency to help you develop, and the sooner you realise this, the better. But, how do you go about it? What questions do you ask? 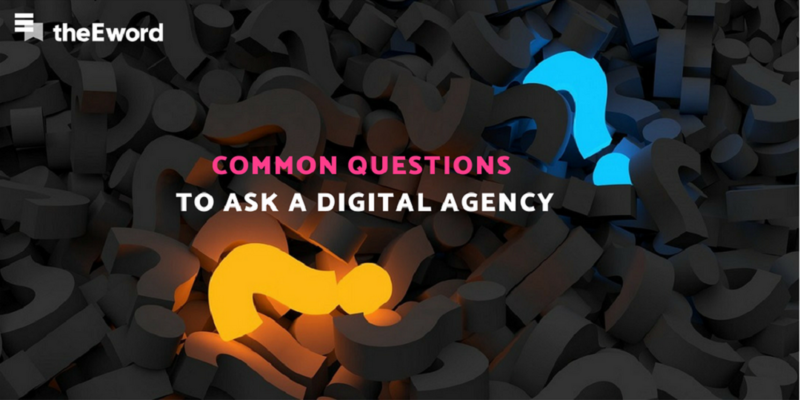 We have the answers in this here blog post, and we’ve split them up into two categories: the questions should you ask yourself, and the questions you should an agency. Let’s start with a bit of basic SWOT by asking yourself four key questions. What are my business’s strengths? What are my business’s weaknesses? What immediate opportunities can I identify that will grow the business? What are the most immediate threats to our business’s growth? What are our competitors doing? Okay, so that was five questions but you get the point. It’s all about knowing your business inside, and out. Maybe you’re particularly good at organising events, or you have great content that regularly gets shared on social. It can be anything. 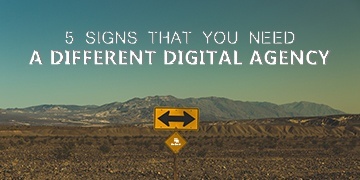 The point is to take these strengths to a digital agency so that they can push your efforts even further. And, your weaknesses? You should know exactly where you fall short, so that your agency can work on improving those areas. Whether your competitors are all better at SEO than you, or you struggle to retain customers/clients, self-awareness is massive. In terms of opportunities, you should think about the different ways you can win new business. Industry networking events maybe, or upselling to existing customers/clients? Know what your competitors are doing too, because you need to know where you stand in relation to them and your industry in general. A good digital agency will have done this anyway, but it’s more for you than anything else. The aim of this initial research stage is to be able to go to an agency with a clear idea of what your KPIs are. Any good agency will ask you this in your conversation, so it benefits you to know exactly. Do you want an increase of social followers? Are you primarily interested in leads? Is PR what you need? All of this is great for you and your business. When you enlist an agency, you’re essentially handing over some of your control to an outside party, so a comprehensive knowledge of who you are will help with the transition and, ultimately, facilitate your growth. Now, for the second phase. What questions should you ask a prospective agency? It’s really vital that you get this part right. If you do, it’ll set the tone for a successful relationship with your agency. There are a lot of questions you need to ask an agency, which we’ll cover here. A recent blog of ours looks at the essential ingredients in every marketer’s digital strategy. This is a good starting point if you’re not sure what services you should look at. 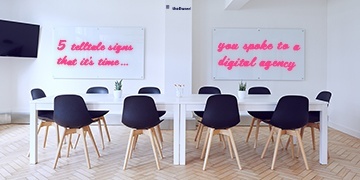 Without further ado, here are the questions you should ask a digital agency. What is it about my business that interests you? With this question, you’ll know find out whether an agency is legitimately interested in working with you, and share the same values with you, or whether they see you as just another money-making project. Your agency should believe in what it is you do. Though it might sound corny, it’s the best foundation on which you can grow digitally. Your answers to this will differ depending on a few things. Is your focus SEO? If so, your site will see improvements within three-to-six months (unless it’s in a particularly poor state). If it’s PPC, then the results can be overnight. You need to be able to plan ahead, so this question gives you a good starting point upon which you can grow intelligently and get a real timeline for success. Working with an agency, you have to take on their practices too: it takes two to tango (and to grow a business the right way). Ask which metrics they deem the most valuable and most conducive to success. It’ll help your processes, too. You’ll learn a lot from a good agency; absorb some knowledge and learn what techniques work for you. One last thing: ask for a detailed report, be it monthly or quarterly. You’ll come to a greater understanding of how they track their efforts and, in turn, how they are influencing your website’s health. This is a given. You need an agency that’s on your page. You’ll most likely know your industry like the back of your hand, having spent a long time growing your business. So, while an agency will have digital expertise and will know how to grow a business, you need to make sure that they have just as good a knowledge of your industry as you do. Part of this is down to you, admittedly. Share your knowledge, as it’s all for the greater good. How do you handle bad PR? This question has a broader reference point. You could almost ask, “How do you handle bad situations in general?” You need an agency that can bounce back from misfortunate situations, one that has the know-how to quickly turn negatives into positives. It’s not all about blogs, y’know. There are so many different types of content out there, and your agency should be specialists in each and every one. You don’t just want blogs and product descriptions. There’s a whole world of content out there, from email campaigns and whitepapers to video content and infographics. Have fun with it! What social channels should my company be on? This is something we’ve covered before, so be sure to take a look. Depending on the nature of your business and the industry you’re in, you will likely suit some social channels over others. B2B companies, for example, found their home on LinkedIn a long time ago. For sectors like legal, financial services, and the like, LinkedIn is king. That said, Twitter is useful for communicating to your audience, too. Done right, you’ll be onto a winner. However, if you’re focusing on a more B2C market, then you’ll want to head over to Instagram or Pinterest (perhaps both). This isn’t to say that Instagram is off-limits for the B2B market, though; it’s just better suited for consumers. One more thing: Facebook is the place to go for paid advertising. You can get some fantastic results. Who will be managing my account and carrying out the work? You should feel confident in the people who are working on your account, and that starts with getting to know them. It goes back to the first question you should ask an agency: What is it about my business that interests you? While it’s not something that happens in every agency, we recommend getting on a first-name basis with the people working on your account. It helps the business-agency relationship to grow: both will be more invested in each other. How do you manage client communication? It’s vital to know how the administrative hours will stack up. Of course, you want the majority of your retainer hours going into real work, and not admin. At the same time, though, an agency should maintain clear lines of communication. It helps to carry that real work through to the end. Ideally, the time spent on client communication and business operations should be 10% of the whole retainer. This varies according to the level of communication some clients want from their agencies. If you want regular updates, make it known: any good agency will make the time. Knowing what your agency needs from you is vital. For example, if your business is in a particularly niche industry, you should host an immersion session so that the team working on your account can get a feel for your business and your industry. You should be able to work and collaborate with your agency in an open environment. In this kind of setting, great ideas flourish. This starts with you being open. There you have it! The path of successful business-agency relationships is beset on all sides by poor communication, weak strategies, and just not enough collaboration. Don’t let this be you: call us on 0161 848 4300 to work with our experienced team of digital marketers. Alternatively, fill out an enquiry form here or book in a call with our Director Kleon – he’d love to talk through your goals and objectives.